Innovation through design from startup to enterprise. We are Ireland’s leading User Experience (UX) Design agency. We give you the power to create outstanding digital products. Our problem solvers, designers and developers are ready to help you create the product you know your customers deserve. Aviva's Mind the Pension Gap calculator provides users with quick insights into their likely pension in retirement. We helped Unum to build a better Claims Intake process, by building a dynamic question path to reduce claim submission time by 20%. Those who see the value of innovation through design. We have partnered with Fortune 500 heavyweights like Aviva and Unum, government agencies delivering change to society and tiny start-ups with massive ideas. 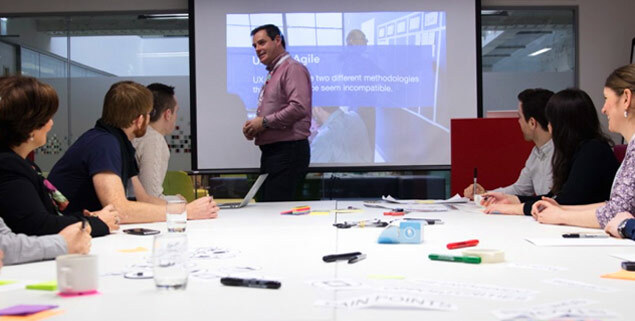 Whether you’re starting off as a UX practitioner or you are aiming to upskill your Enterprise Team, we have the training course for you. Our courses have been designed by senior staff with years of hands-on practical experience.